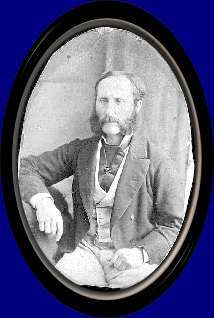 Samuel Anderson was born on the 15th November, 1839, in London. Anderson's father, Samuel Anderson, was a writer to the signet, was registrar of affidavits at the Court of Chancery in London. There Anderson went to school, later going to St. Andrews University and the Edinburgh Military Academy. Anderson entered the Royal Military Academy at Woolwich on 11 August, 1857 in the first batch of cadets selected by competition. He won the sword for "Exemplary Conduct" and received a commission as Lieutenant in the Royal Engineers on 21st December, 1858. After a few months of service in England, Anderson was appointed to the staff of the Boundary Commission. After intensive instruction in astronomy at the Ordnance Survey Office in Southampton, Anderson left England for Victoria. By the Panama yesterday, there arrived several British "red coats". They are a portion of the Engineering Corps, destined for British Columbia, and are under the command of Lt. Anderson. Anderson and his party of RE arrived in Victoria on the 2nd December, 1859. 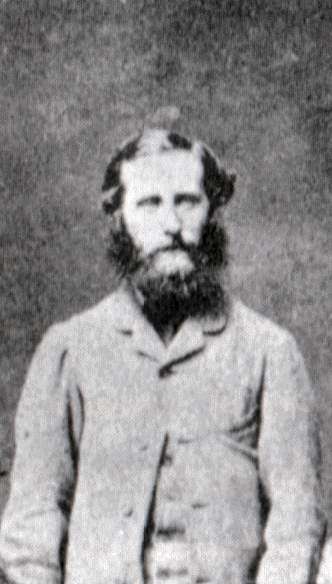 Anderson went inland at once to join the Commission, stopping at the Camp at New Westminster. "As soon as I arrived in Victoria, I had to leave all my men, except the two photographers, and go straight up to the country to join the main body of the expedition." Saturday 10th December – Anderson RE arrived with 2 men to join the Boundary Commission. "I was then (Dec. 14th) staying at Col. Moody's camp, New Westminster, and waiting for an opportunity of getting further up the Fraser river, where our people were encamped. The river was all frozen up at that time and all traffic was of course completely stopped." - 6th January, 1860 - The Letters of Lt. Anderson. Anderson's duties on gaining the Commission were to be surveying and reconnoitering ahead of the other parties, and to assist the Astronomers when not employed in those duties. Excerpts from Lt Anderson's Observations on the Boundary Commission. "I have been investing lately in 30 yards of Tarleton that being the best substitute I can get hold of for mosquito curtains." (March 28, 1860) Our surgeon a Dr. Lyell R.N. of Aberdeen, is a most experienced man. In addition to having been in every ordinary portion of the world, he has been on an Arctic expedition under Franklin, and on an Antarctic expedition under Sir E. Belcher, and tho' not a very talkative man, we get curious yarns from him at times. It is very lucky that we are all under the Foreign office, as the officers who are under Col. Moody being the pay of the colony can't get any, as the colony has no money at present. None of them seem to like the Colonel [Hawkins] as he is said to have rather a petty and mean disposition… One bad trait in his character and particularly Gosset's is running down that unfortunate man Col. Moody. The latter (Gosset) calls Moody a drivelling idiot. He told me so the very first time I saw him, and that is rather a strong term for one officer to use towards another so much older. I could not help taking a dislike to Gosset from that very fact. We expect to make some good bargains in trading with the Indians, as they will often give a fine horse for an old red jacket, and also some very valuable furs. (March 6, 1860, Esquimalt Barracks) I have not made any calls on anybody since I came back, but I shall have to go and see the Governour and the Admiral if possible tomorrow, and then there will be the bother and formality of dining with them which is objectionable tho' not the less necessary. There are 2 Miss Douglas's, daughters of the Governour and of course the greatest flirts on the Island and I certainly have very little desire to make their acquaintance in consequence. (April 14, 1860) Mrs. Douglas never appears and her two daughters, aged about 22 and 18 respectively, they say make her do all the domestic work, while they sit in the Drawing room doing nothing. (May 27, 1860) The Governour gave us a capital lunch… I had a long chat with one of the daughters and after it all I came to the conclusion that she was a born idiot. At dinner they have a curious fancy of heaping all kinds of miscellaneous articles on to their plate at the same time, and don't seem to care for a change of plates. They all make a practice of putting their knives into their mouths, dive into the salt with their knives, for they are not aware of the existence of salt spoons, and will extract potatoes from the dish that contains them in a similar way. I was actually pressed most earnestly to take some cheese while I was in the middle of a mince pie, and we has to drink sherry out of liquer glasses! (Jan. 26, 1861) Mrs. Wickliffe [age 22], wife of a Lootenant Wickliffe (as the Yankees always pronounce it) has only been married about 6 months. She is a short little body, rather good looking and a most thoroughly noisy Yankee. She was dressed if you must know now, in a black silk dress, made with a very short waist, and a large buckle placed in front securing a ribbon around the waist, and this buckle seemed to me to be placed in a similar position to the top button of my waistcoat, and then all the rest was skirt. In fact things did not seem to me to be in proportion. The other lady [Mrs. Lugenbeel, wife of the CO, age about 37] was dressed in a red Merino dress with large sleeves turned over and displaying red silk lining. Whether this was done to convey the impression that the whole affair was lined with red silk or not, I do not know, but it certainly looked much like it. However, I thought to myself if all the lining was like that the best part of the dress would be in the inside, which is absurd and then I was lost conjecturing what the probable lining really was. The ladies out here are not so ceremonious as those at home, they very often speak of gentlemen by their surnames! March 28, 1860 Esquimalt Barracks) We had a visit from the American officers Capts. Woodruffe and Hunt, who of course received every attention from the naval officers and ourselves. I dined at the Admiral's with them, and of course we were obliged to drink the health of the United States President, after we had drunk the Queen's health. Most of them appear so distant generally, and they cannot understand our always calling them by their surnames as they always give us our titles of Mr. or Captain. Even speaking to one another, they address themselves in that way! Our men gave a ball at the barracks on the 17th of last month to which all the settlers and their wives were invited. They were all invited to come at half past 7, but they all began to assemble at half past 3, and by about 6 everybody appeared, so the ball had to begin long before its time. They all came in their sleighs, quite 25 sleighs altogether, and as there was not stable accomodation for all their horses, the unfortunate animals had to stand out in the cold all night. Most of the farmers' wives are half white and half Indian. They cannot talk English but most of them talk Canadian French as well as the Indian language of their mothers. There is a wonderful dance they have, called the "Reel de Huite", a sort of Caledonian quadrille consisting of 4 figures, which they keep dancing over and over again till the music is tired, when the ladies rush to their seats and a fresh lot spring up immediately and the fiddler has to begin again. There are only 2 things required to get up a Ball in this part of the world, and these 2 things are a Gallon of Whisky and a Fiddler. We had 4 fiddlers at out Ball who relieved one another so there was no cessation of music. The ladies are rather shy and generally say "Non" or "Marche" (the latter equivalent to "Hook it") when they are asked to dance. You then have to take hold of them by the hand and pull them out, and when once they are out in the middle of the Room they submit willingly. On 2 or 3 occasions however after I had got my partner out, on looking away for an instant I found she had bolted, and really one is so much like another that I could not find her again, but had to take another at random. The men had the room very nicely decorated with flags and swords and rifles and all kinds of pictures on the walls. I suppose there must have been 80 or 90 people present including about 30 ladies. The latter showed no symptoms of being tired, for they kept on dancing till daylight. I stayed up till about 3.30 a.m. and I felt I had enough of the Reel de Huite, so I turned in and left them dancing away as lively as ever. Three of the American officers came down... They brought 3 or 4 of their soldiers down with them. One of their men was intoxicated when he arrived and in the course of the evening he found his way into Col. Hawkins' Quarters, locked the door, sat down in the arm chair in front of the fire, pulled off his boots and lit his pipe. So the Colonel after coming out of the Ball Room, on trying his own door was astonished to find it locked. After a good deal of shouting the soldier unlocked the door and allowed the Colonel to come into his own room, and then there was a tremendous explosion. I never heard the Colonel in such a rage in my life, and the whole thing was so absurd that even now I can't help laughing when I think of it. The soldier said he was an Englishman and came to take care of the Colonel's Quarters. Then there was another explosion of anger, and the whole thing was ludicrous in the extreme. The man after requesting permission to put on his boots, which was granted, was then taken over to our Guard House and locked up for the night. I suspect the soldier got half killed for the offence when he returned to this own Barracks the following day. I didn't pity the man in the least for I heard afterwards he had been bragging of being a deserter from the English army in Canada. There was another ball given afterwards at the Hudson's Bay Company's Post about 2½ miles from here. There were even more people there than at our place and the dance lasted from 6 in the evening till about 12 in the middle of the next day. Some of the ladies actually have hoops and it certainly is a very great improvement upon the straight up and down appearance of the ladies' costume without them. I did not got to bed at all that night for I got home just in time to complete my toilet for breakfast, but as you may suppose I did not feel fit for much that day... I don't think I shall go to any more of these gatherings! The younger one had a great habit of exclaiming "Good Gracious alive" and "pshaw" in different portions of the conversation. Our Colonel was talking to her about the severity of the weather and the firmness required for using icy cold water in the morning, saying that he always did it, tho' he found it very trying at times. Well, what do you think was this young lady's answer to this? Why, she said these words, that when she got up in the morning she only gave herself 'a LICK and a PROMISE' and then went down to breakfast with the intention of completing her toilette in the course of the day! I am glad to say her husband was not present at the time or else I should think this confession would have shamed him from appearing again." "I suppose you saw the picture of the new President in the Illustrated News. Did you ever see such a coarse looking man? We are going to cut out his likeness and stick it up at one end of our Mess Room, and put up at the other end a likeness of our most gracious Queen, so that our American friends when they come down to see us may be struck by the contrast."